I've played most of the Final Fantasy games up until this one, so in spite of the bad reviews, I wanted to give this one a try. I really liked it. Let's get the ugly out of the way. This game suffers from one of my most hated sins: initially, it doesn't want to let you play. I counted, in this case. Two hours before I felt like I was actually given any control of the game. And I felt like the game kept the kids gloves as far as composing parties and individual character advancement, until about twenty hours in. I've quit plenty of games out of frustration because I just got tired of being treated like an idiot. It's for this reason that I won't play Zelda: Skyward Sword until I can get it under $20. Because they told me Twilight Princess was good, too, but feeling like I still couldn't be trusted to control the hero after several hours of gameplay just got to the point where I snapped and couldn't handle another hour of "training" mode. The story, too. Fal'cie, L'cie, cocoon, pulse..... terms that kept coming up to describe what was going on, and it took me a long time to remember what some of these meant and so the story didn't make a lot of sense. Guess I could've read the datalogs, but if I felt like reading, I would have picked up a book instead of a game controller. I initially didn't like the characters either, but they grew on me. Perhaps because they all have character progressions, which helped me grow attached to them all... even the guy in the skull cap, who just screams "douche". 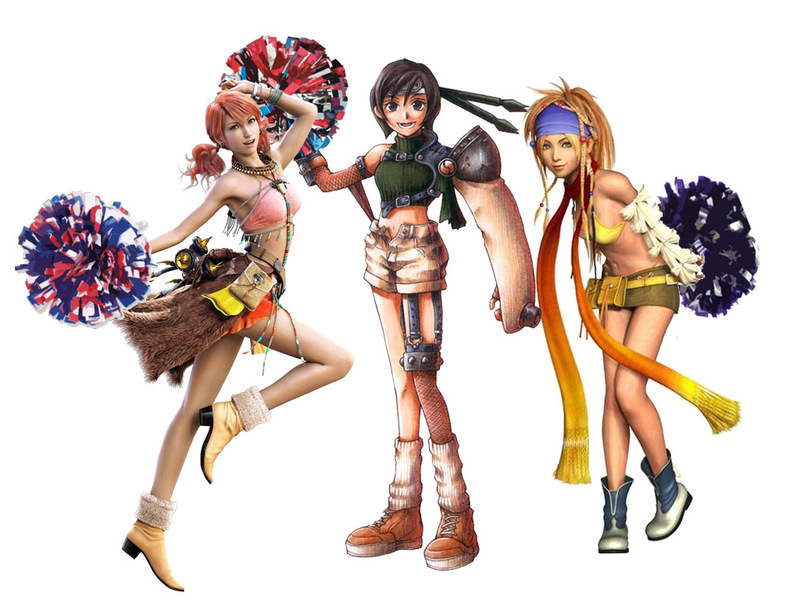 So initially they're all annoying, and the only one that gives you and reason to keep playing is the quirky girl that's in every Final Fantasy game, hair color may vary. And even she has her secrets. 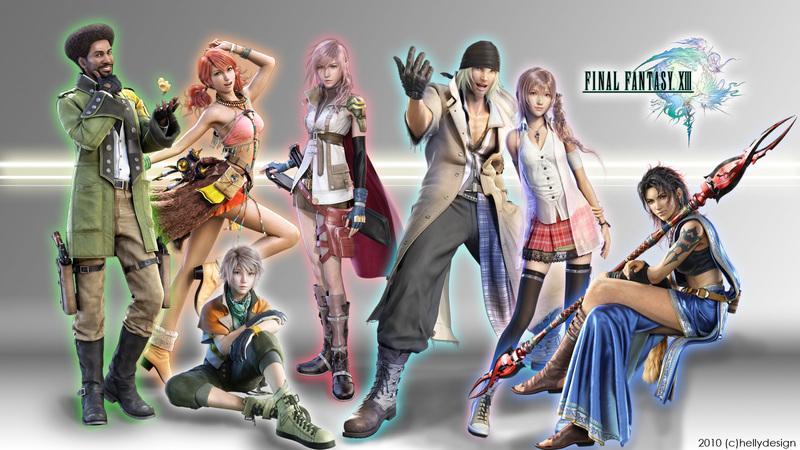 If you've ever played a Final Fantasy game, you know the one I'm talking about. What really sets this game apart from games past is the paradigm system. As usual, you never command more than three characters at a time. But in this case, you're not controlling the individual moves of two of the characters... only the one you designate leader (well... once you're allowed to actually control party composition, about twenty hours in). And even the leader, more often than not, you're selecting auto-attack anyway. Two DPS classes: physical (Commando) and magic (Ravager). Ravager attacks help build chains where your attacks progressively deal more damage, while commando attacks stop those chains from expiring between attacks. A tank (Sentinel) and a healer (Medic). And two buff/debuff classes. Synergists buff allies, while Saboteurs jack up your enemies. And within the confines of a tough fight, you'll have to have your characters jump between the classes they've learned. A commando and two ravagers will be your go-to paradigm for dealing swift-and-blinding fury, but what if you start taking damage? Maybe switch to a commando-ravager-medic paradigm? However, if you have an enemy that can kill with one hit, you may need a sentinel to draw damage for those fights... but when you've got that same enemy on the defense, you'll want your him to stop tanking for a few minutes and become a damager. Or what if your enemy goes berserk? You may need two medics just to keep the sentinel up! And managing tough battles where you have to jump between paradigms and select the best players before hand is actually a lot of fun. In every final fantasy game, there's a hunting area, and I've been there the last two days because the most fun in the game for me is finding the right party make-up and paradigm strategy for these "boss" battles. I am seriously enjoying the game that much right now. 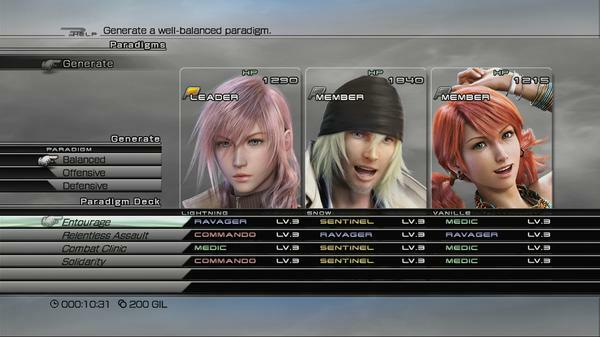 2) For every character combination, you can select up to six paradigms. But they're not saved. Which means that each time you switch up characters, you have to go in and select your paradigms, because the two or three presets just won't cut it. I end up sticking with characters who aren't the best for a particular fight, because I don't want to spend a minute creating all my paradigms. It only takes a minute, but as many battles as there are in the game, those minutes could quickly turn into hours. 3) I keep wanting to at least control my main character, even though auto-select makes more sense. And so I keep pushing my button like an idiot between moves. I'm pretty sure this game is speeding up my eventual carpal tunnel, more than any game I've played in recent years. For all my appreciation of this system, I'm not completely adapting even after many, many hours. But it's still a pretty unique approach to a party RPG, and I've really been enjoying it. I haven't finished it yet, but just based on the fact that I want to stay in the hunting area and fight "bosses" (and presumably gain lots of experience which will allow me to finish the game quickly once I leave) I'm ready to go ahead and score this: 4/5. There are still bugs in the system, but I hope it's not the last time I play this system. Maybe XIII-2 will perfect it? I get why a lot of people hate this new party system, since it feels like you have less control over the individual characters. But for me, it's a different train of thought that feels no less exciting; I encourage anyone whose ever like a Final Fantasy or JRPG to try it for yourself. I haven't played the FF franchise since VII, but I prefer games like MW2 that give you a brief intro to the controls a playground to test that control and then on to the game.